Coalition politicians have claimed this gagging bill is necessary to protect my seat, but it goes against everything I stand for. With the Guardian’s recent poll showing half the country is angry with politicians, you might think this isn’t the best time to introduce draconian legislation that will muzzle dissent and crack down on popular campaigning. But then again, you might also think a government that came to power promising a new “big society” might welcome robust and healthy public debate, led by a diverse range of grassroots campaigners. Which only goes to show the extraordinary hypocrisy of the coalition in ramming through its transparency of lobbying bill (better known as the gagging bill). By imposing a quite astonishing range of requirements on campaigning organisations in the run-up to elections, it would effectively shut down legitimate voices seeking to raise awareness on issues of public interest, whether they are on NHS reform, housing policy, or wildlife conservation. Campaign spending limits for “third party” organisations – such as charities and pressure groups – would be drastically cut, and the definition of what constitutes campaigning broadened. And there would be new forms of regulation for organisations lobbying on issues at constituency level. Ministers have obviously been chewing over this question, and have come up with an intriguing answer. It is, you may be surprised to learn, to protect the Green party’s only parliamentary seat from undue lobbying influence. Yes, apparently Tory and Lib Dem supporters of the bill are defending its swingeing provisions at public meetings up and down the country by claiming they’re necessary in order to prevent fracking firm Cuadrilla pumping a million pounds into Brighton Pavilion to unseat me, and – of course – they would hate to see that happen. Touched as I am by this sudden outpouring of concern for the security of my seat, it is, of course, complete bunkum. Big business or wealthy people like Lord Ashcroft don’t influence politics through charities, small community groups or campaigning organisations. They often already gain it through family connections or social networks, or they buy it through donations to political parties. Or, in the case of the big energy companies, they helpfully supply staff to work in government departments. The provisions of the lobbying bill will do nothing to stop any of that. Many of the politicians currently crying crocodile tears over voter apathy or about party membership are the very same MPs who are championing a bill designed to close down citizens’ engagement with the democratic process. Where democracy and participation is alive and well is at the level of ordinary people’s involvement with charities and organisations such as 38 Degrees. Sadly, one of the underlying reasons for the government’s attempts to push through this bill is that it’s afraid of the power of informed and organised public opinion. What happens over the next few weeks, during which the bill goes through report stage in the Lords before coming back to the Commons, will have major implications for the future of democratic debate in this country. If Nick Clegg and David Cameron get their way, the legitimate voices of the third sector will be suppressed, and their power neutered. If they are determined to push through a law that silences opposition and destroys such a vibrant and rich civil society, they could at least refrain from claiming it’s on my behalf. Because it certainly isn’t, and I look forward to making that very clear in a public meeting about the bill, organised by 38 Degrees, in Brighton today. 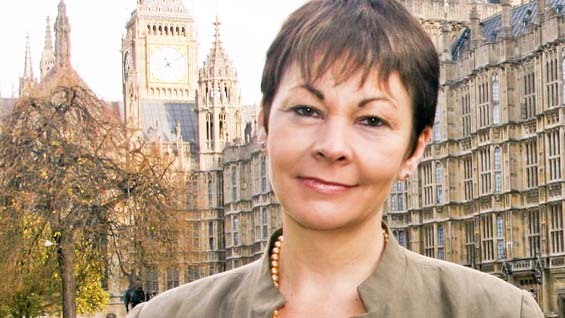 This entry was posted in National News and tagged Caroline Lucas, Ecumenical Advocacy Alliance, gagging bill, Green Party MP, Green Party MP Caroline Lucas, lobbying bill, tamesidegreens, the Electoral Reform Society, Women's Institute by tamesidegreens. Bookmark the permalink.